Wahpenayo Peak is a prominent summit located on the western end of the Tatoosh Range along the southern boundary of Mt. Rainier National Park in Washington State. Located between Chutla Peak to the west and Lane Peak to the northeast, Wahpenayo's summit commands a great 360-degree views of its surroundings including Mt. Rainier across the valley to the north. This peak likely receives fewer visitors than nearby Eagle & Chutla. The easiest approach is from Longmire, hiking the Eagle Peak trail most of the way up to the Eagle-Chutla saddle before turning off to follow a user trail over to and up Wahpenayo's west ridge. Route is a scrambly class 2-3. There may be other approaches as well. Wahpenayo could easily be combined with Eagle & Chutla - or other peaks along the Traverse for a full day outing. Some of Wahpenayo's other satellite peaks might also make for some interesting exploring. From the Nisqually (southwest) entrance to Mt. Rainier National Park, follow the road ~7mi to Longmire. Turn right at the entrance near the Longmire Wilderness Information Center and drive through the housing area for the park employees to cross a narrow one-lane suspension bridge over the Nisqually River. Locate the trail on the left/east side of the road a short distance past the bridge. Alternately one can park at the Wilderness Information Center and hike in. A fee must be paid on entering Mt. Rainier National Park. Wahpenayo Peak is probably best climbed in late-spring to fall - although it probably can be climbed all year 'round. Possibly climbing may even be easier when snow-covered. There is likely some avalanche and cornice hazard along Wahpenayo's ridges and cliffs in the winter. The road to Longmire is usually open during the winter. The closest car-campground is at Cougar Rock, north of Longmire inside the National Park. A backcountry permit (available at the Wilderness Information Center in Longmire) is required for camping up on or near Wahpenayo Peak. there are some flat bench areas on Wahpenayo's northwestern slopes where camping is possible - although water may be an issue later in the season. This site posts the current trail conditions for the Mt. Rainier area. The status of the Eagle Peak trail can give you a good idea of what to expect at least on the first part of the approach. 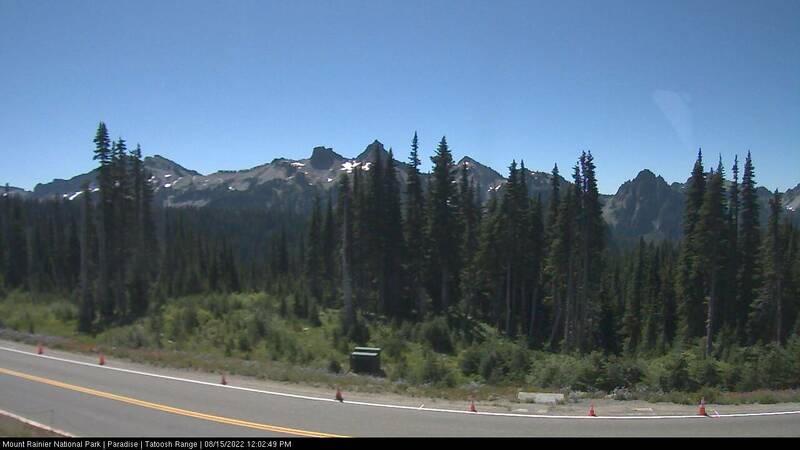 Webcam from near the Visitor Center at Paradise. Wahpenayo is not visible, but the peaks are of similar height which can give one a good approximation of conditions in the area.